Since coming home from school mornings have been a bit more relaxing. Scrambling around to get ready in time to walk to class after staying up far too late studying isn't something I've missed. I have taught myself how to become a morning person over the years and am by far most productive during the morning. Because of that, since being at home I've tried my best not to sleep too late so that I can start my day and get work done when I am most focused. I am one of those annoying people who sets an alarm even when I don't have plans but I can assure you that I don't feel like abiding by that alarm every morning. 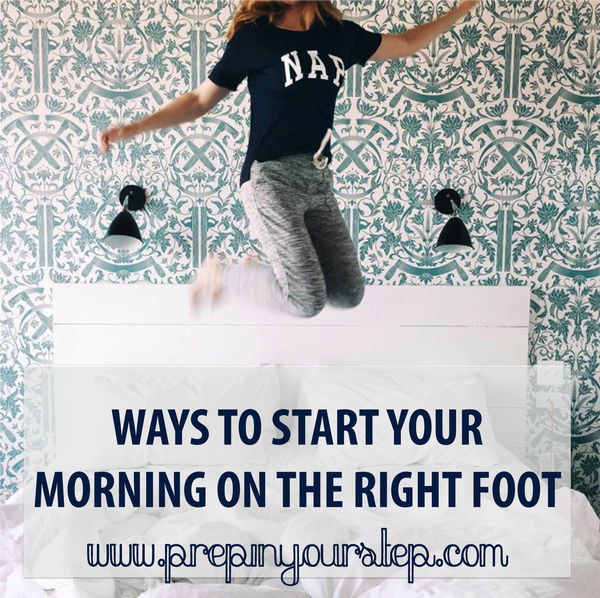 On those mornings when you feel like pulling the covers up over your face and stay in bed here are some tricks that I use to start my morning off on the right foot (because this is Prep In Your STEP after all…thanks for bearing with me even after that cringe worthy joke)! Still trying to master this technique but I think a good way for me to start would be to stop setting 5 different alarms in three minute increments. Getting up when that first alarm sounds is a pain when you know that you could still be ready in time after the third or fourth alarm goes off but that small time that you can fall back asleep makes you more tired in the long run! Waking up is a bit more forced when there is a bit of light waking you up. I prefer to sleep in total darkness (my room is like a cave when I sleep) but letting some light in once I am up helps my body to adjust and begin to wake up. Open your curtains right when you get up and you'll start to wake up quicker! My life feels a bit more together when my room is nice and tidy. Coming home to a made bed makes that little extra time spent making it in the morning worth it. Washing your face in the morning not only helps to wake you up but also makes you feel refreshed. Whether you just splash some water on your face or exfoliate this trick always helps me to get my day going. I am a grouch if I skip breakfast. I used to be the type of person who wouldn't eat breakfast until a while after waking up but I've slowly become someone who makes breakfast first thing and that is quite possibly due to the fact that it means I can get coffee in my system sooner! I try to get a little food in my stomach before taking my first sip of coffee so that is the perfect encouragement. My whole day is thrown off if I skip breakfast and I am definitely in a much better move when I start my day with food. My go to breakfast is a Kashi Cinnamon Waffle piled high with peanut butter. I find that this keeps me full for a while and is also delicious! At school I find it to be a bit tricky to workout in the morning since I like to take 8:30 classes (call me crazy, all my friends do). I have on occasion gone to some 6 am classes but then I have to rush back to school to shower and head to class. When this is the case even stretching or opting to walk to class (perks of living on campus) help me to feel more energized in the morning. At home, I've been going to 8:15 classes which helps to keep me focused through the morning while I try to get work done! Two things I hate. 1. Waking up late and feeling rushed. 2. Forgetting something important I have planned and feeling frazzled. Because of that I try to make it a habit to check my planner first thing in the morning to get an idea of all I have going on that day. I can feel a bit more relaxed and ready to take on my day when I know what is to come. My taste in music is all over the place. While sometimes I want to listen to something calming in the morning the best way for me to feel excited and ready to take on the day is by listening to some sort of super upbeat playlist. Think of those songs that you LOVE to sing along to that always make you smile and play those on your drive to work or while you get ready! I would love to know if you follow any of these things to make sure you're starting your day on the right foot or if you have any other suggestions for me to try out! I hope y'all have a happy (and lucky) Friday the 13th and have some fun plans for the weekend! I'll see you back here on Monday morning hopefully equally as excited and energized thanks to these tips! How would you adjust this for those of us who are nocturnal? Great tips!! I am totally guilty of hitting the snooze 4 or 5 times before I actually get up. Sometimes I get up 15 minutes before I have to go. I am the worst. This will be helpful!! Oh my goodness, Dorothy! I love these tips! I am so not a morning person but these will be so helpful for the last few weeks of school!